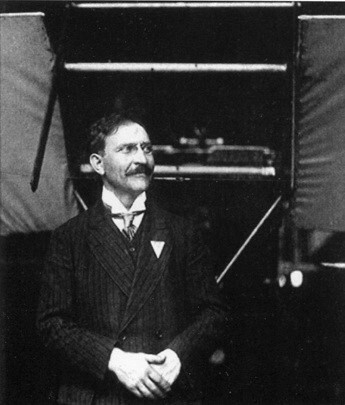 August Heinrich Euler (He was born as August Heinrich Reith, but later took his mother's maiden name) was born in Oelde in Westphalia on November 20th, 1868. He started a graphics education, but didn't finish it and instead studied mathematics, philosophy and commercial law on his own. He was a keen sportsman all through his life, racing bicycles and later on cars and practising many other sports. In 1883, after the end of his three-year military service he started working as a technical tradesman for Seidel & Neumann, a sewing machine company, travelling to many towns in Germany and abroad. Later the company turned to cycles and motor cars. Euler himself took over the cycle racing and later motor racing activities, which brought him to aviation. From 1898 to 1904 he worked in the automobile industry in Frankfurt and Dresden. In 1904 he started his own business as agent and wholesale dealer of automobile equipment for the industry, cooperating with Bosch and several other big manufacturers. In October 1908 he founded the Euler-Werke in Frankfurt and managed to negotiate a license agreement with the Voisin brothers. 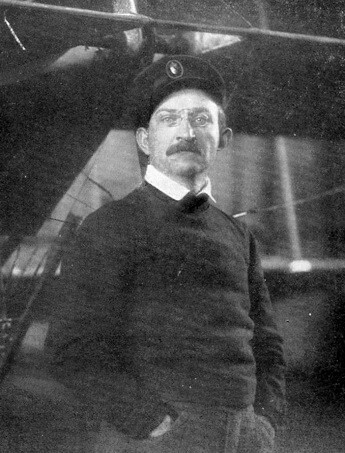 He leased a part of the Griesheim exercise field outside Darmstadt, where in February 1909 he created a 2,400 Marks factory at Griesheim Airport and started large scale aircraft production and in early 1909 made his first flights. The first few machines built were similar to Voisins, but Euler was not pleased with the original design and soon started to modify the construction, for example by lightening it, redesigning the landing gear and introducing ailerons. Euler qualified for German pilot's licence No. 1 on December 31st, 1909. Prince Heinrich of Prussia took his pilot's certificate on an extensively modified example of the type. At least 30 other Germans learned to fly on this aircraft. Euler's first public flights were performed at the ILA exhibition at Frankfurt and he participated in the 1909 Frankfurt meeting. August Euler participated in the Frankfurt 1909 air race meetings. He started a flying school in Griesheim, where more than 40 pilots were trained without major accidents and several flying displays were arranged. On October 25th, 1910 he made a flight of 3 h 06:18, a new German endurance record. He won in 1910 the longest flight at 3hr 6min. 18sec. In 1910 he patented a machine gun installation for aircraft, and at the request of the German War Department some sort of presentation of it was withdrawn from the Berlin Aeronautical Exhibition of 1912. In 1912 the activities had outgrown the Griesheim field and Euler moved to a new factory and airfield outside Frankfurt and joined the newly formed German aircraft manufacturers' association.. Before World War 1 around 100 machines of several types were built, among them the famous "Gelber Hund" ("Yellow Dog"), which made Germany's first mail flight. An early wartime reconnaissance type was the BII tractor biplane (built at Frankfurt in late 1914), an early version of which had tricycle landing gear; B III was a license-built LVG; Type C a pusher of 1916; Dr 1-Dr 4 were triplanes. A quadruplane was also built (though top surfaces were really full-span ailerons), but Euler types achieved little distinction after 1916. During the war Euler-Werke built many prototypes, but production contracts were mainly for Nieuport-copy fighters and license-built LVG two-seaters. After building around 350 airplanes during the war the Euler-Werke was taken over by French occupation forces and closed. The innovative Euler had filed around 120 patent and utility model applications, the most important perhaps the 1910 patent for fixed fuselage mounting of a forward-firing machine-gun, which earned him considerable license fees during the war. In December 1918 Euler was appointed "Unterstaatssekretär" of the Reichsluftamt with the task of developing civil aviation, but the restrictions of the Versailles Treaty made this impossible. When the treaty was ratified in 1920 the frustrated Euler retired. He built a house in Feldberg in Schwarzwald, where he lived the rest of his life, still involved in sports and in several German motoring and aviation associations. He died there on July 1st, 1957.